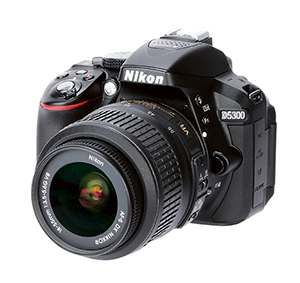 While the D5200’s body has a polycarbonate e xoskeleton that is based around a metal chassis, the D5300 body is a ‘monocoque’ design. This involves using a single shell made of carbon-fibre-reinforced plastic without the metal chassis, which cuts down on weight while maintaining durability. As a result, the D5300 weighs just 480g and has dimensions of 125x98x76mm, which is 25g lighter than the D5200 and a few millimetres smaller in width and height. The depth is unchanged, so the handgrip is still chunky and comfortable. I found that even with large lenses the D5300 felt well balanced in my hand. The camera has minimal buttons and the layout is very simple. By hitting a button marked ‘i’, users can access the shooting menu on the LCD, which can handle most controls users are likely to need. I found myself using this for the majority of situations, although it was too slow for quick adjustment of the ISO. For this reason, I opted to set the custom function button located near the lens mount to access the ISO adjustment. The menus are very easy to navigate and have optional tips should users not understand a setting. In general, the system is ideal for ‘entry-level’ enthusiast photographers.